Check 'n Go Reviews - Legit or Scam? Check ‘n Go Reviews – Legit or Scam? 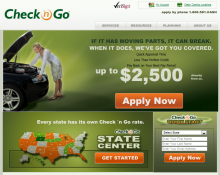 Check ‘n Go is one of the nation’s largest and most well known payday lenders, as well as specializing in car title loans, check cashing, payday cash advances, and short term installment loans. Check ‘n Go was established in 1994 and provides lender services to customers at their in house locations in all 50 states, as well as services online. Not at all services are offered in all 50 states, however, due to individual state rules and regulations. Check ‘n Go prides itself on working with your schedule, and not on banking hours, so that you can access check cashing and other financial services when you need them. There is a wide ranging national debate concerning the validity of payday loans and payday cash advances. Since payday loans are targeted at people who need cash immediately and have no other means of receiving it, payday lenders often charge high interest rates, with the nationwide average being 390% APR. In order to protect their citizens from predatory lending practices, most states have created rules and regulations regarding the approval of payday loans and limiting their fees. Some states have even outlawed payday lending, while others have few regulations that limit payday lenders. But those who defend payday lenders claim they are providing a valuable service to people who would otherwise have no options for financial help, as they wouldn’t qualify for help from traditional banking institutions. How Does Check ‘n Go Fit In? Check ‘n Go is a member of the Community Financial Services Association of America (CFSA), a national organization that promotes responsible regulation of the payday lending industry. CFSA requires their members to state their terms and fees as clearly and as easy to understand as possible, so that borrowers have the best chance at successfully paying back their loans. To that end, Check ‘n Go also offers a guide on their website addressing each state’s individual regulations and fees concerning payday loans. However, at the end of the day, you are still the one responsible for all loans, so make sure you understand all terms and fees before agreeing to anything. Note: If you’re interested in learning more about Payday Loans check out our detailed guide, “Payday Loans Explained: Should You Ever Get One?” for more info. Average Rating for " Check 'n Go " is 1 out of 5 based on 1 reviews.